Earlier, Zach wrote a blog post on the ins and outs of chart selection. It reminded us how important it is to balance the right chart with the right visual presentation as dimensions and complexity change. But your data presentation decisions don’t end there! Once you have a good handle on the right structure for organizing the presentation, you have to make it look good - making it function good and accomplish original goals. As promised in the previous post, here are the chosen chart structures at each stage of complexity redesigned for presentation. We’ll keep this simple with before and after shots, key design principles highlighted, and a freeform reflection on some practical design decisions. The explanations aren’t meant to be exhaustive but rather are a glimpse into design thinking. For fonts, often the best choice is sans-serif, tabular fonts (like this). For this demonstration I simply used Helvetica because it gets the job done and everyone has access to it. The font size is 18pt for primary values and 12pt for secondary. Qualitative values (calls, sales) will often be the text that should be treated with grey (50% black will do for most situations). Quantitive values (559, 71,739) should be clear and easily distinguished from less immediately critcal information. Here they are bold, 80% black. Superscript the dollar sign since its an unchanging qualitiative value. Stacking the calls and sales bars should only be done with the right audience in mind. 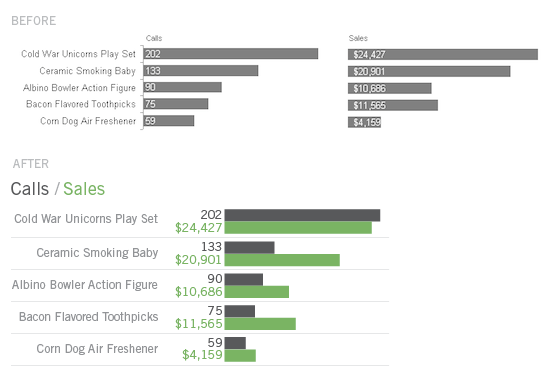 Though a dollar to calls value is not comparable in and of itself, in the midst of the context of other products, this makes it easier to visually compare the proportions of these values against each other from product to product. For example, immediately one can notice ’Ceramic Smoking Baby’ is a lucrative product. Again, color should only be used to distinguish commonly changing quantitative values: numbers and bars in this case. But sometimes carefully using color on qualitative values can be helpful. The title (’Calls’), value (’202’), and visual representation (longest bar in this case) is an example good color management. No legend is needed, because the content itself explains visual relationships. The content is the legend. Choose your 50% grey visuals wisely. 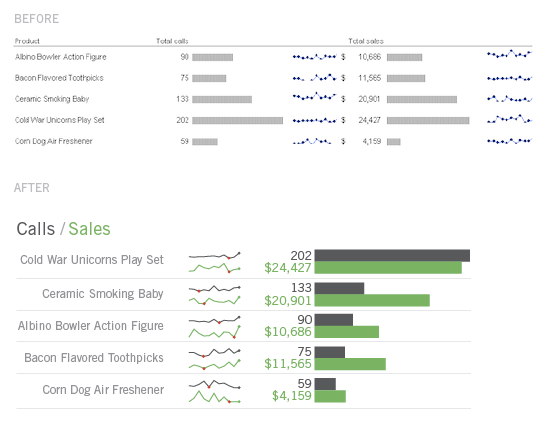 Product names are secondary in visual weight to colored data values, because they are secondary mentally in the thought process of reading this chart. Placing metric values to the left of the bars overcomes problematic rendering issues when values are very small. Dollar signs are not superscripted because they would become unreadable. 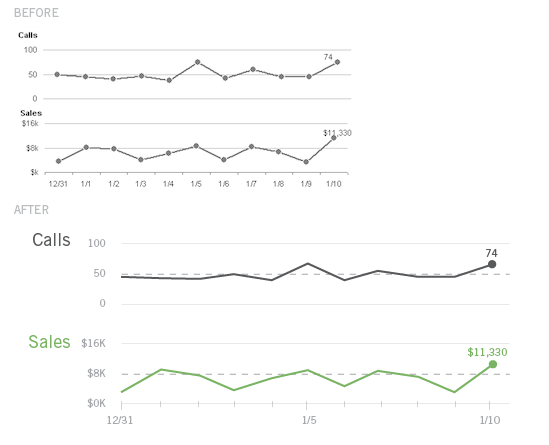 I put the sparklines first in the visual reading for two reasons: 1) the width of this graphic is always the same/dependable and 2) the context of data is often helpful to present first so subsequent values can be better understood. This little snapshot of time provides that context. Be sure to provide ample space between elements, and that all graphical elements are aligned on your grid. Newer PostCan familiarity trump usability?